Ultrasonic cavitation is a process where you transmit waves of ultrasonic in to cellulite affected areas of your body. 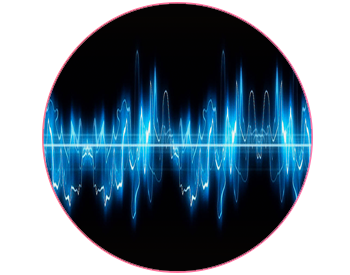 The frequency of the ultrasonic is set to disrupt the fat cells that are causing the cellulite to appear. The continuation of the cavitation therapy causes the fat the get moped up within the lymphatic system and disposed of via the liver. The technology is very effective and a real technological breakthrough for getting rid of cellulite. 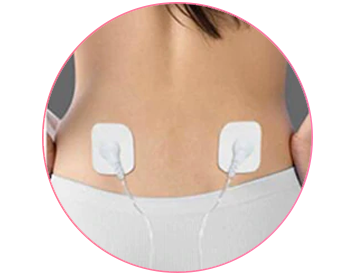 5 Modes of EMS (Tapping, Massage, Knead, Scrapping, Slimming) , 5 intensity selections, freely choose one make you feel comfortable. 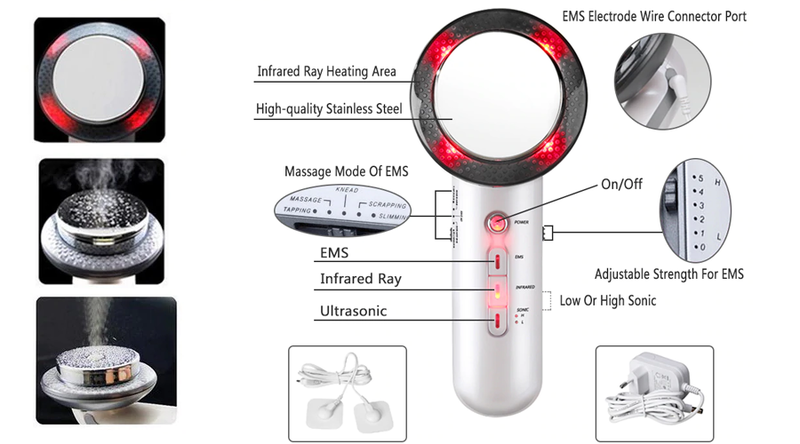 Infrared heat sensors penetrate deep into skin, so you can feel the heat generate and soothe. Ultrasound technology helps slim down fat by decreasing waste around fatty tissue and tightens skin. Target problem areas with Ultrasonic Cavitation Remover and see visible results within 2-3 days! Cavitation treatments at local beauty centers can cost upwards of hundreds of dollars for a single session! Why pay so much when you can have as many treatments as you want in the comfort of your own home? 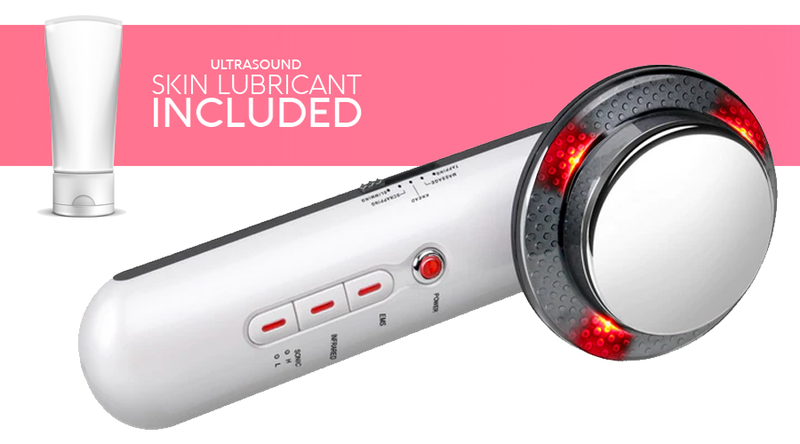 Ultrasonic Cavitation Slimming Machine produces infrared heat to encourage blood flow underneath the outer skin layer. Fat deposits are broken down and eliminated by the body. Aches and pains are also reduced because of improved blood circulation. – Negative Ionization: acne and blemish particles are positively charged. 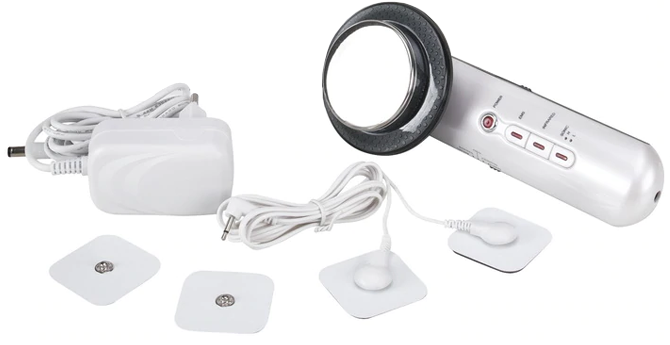 This device can provide negative ionic charges to remove the positively charged particles like acne and blemish particles from the lower layer of your skin. – Enhance skin texture, anti-wrinkle, helps fight fatty areas, tightens and firms. A Group of UltraSonic Wave Displays Melting of Fat! EMS + Infrared + Ultrasonic The ultrasonic wave massage can helps to burn fat and tighten your skin with no rebounce. SLIMMING AND TONING- Ultrasound technology helps slim down fat by decreasing waste around fatty tissue and tightens skin. 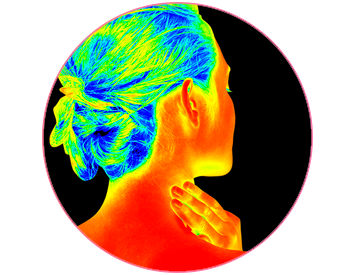 HEAT THERAPY- Infrared heat sensors penetrate deep into skin, so you can feel the heat generate and soothe. SKIN REJUVENATION- Help activate cells and skin and regenerate skin elasticity for better looking skin and feeling skin.